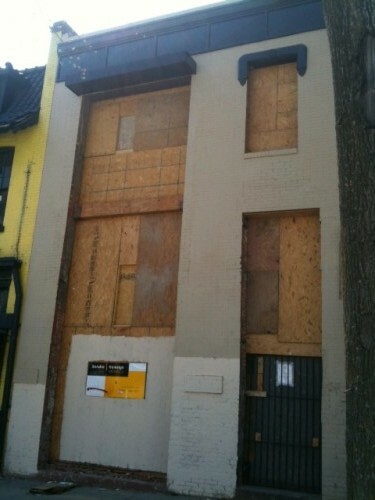 We’ve been wondering what restaurant will be coming to 2208 14th St, NW (just north of W) since Sept. ’10. Yesterday I shared some scuttlebutt that Piola Pizzeria would be coming to the corner of 14th and V St, NW. Turns out the 72% accuracy rating was pretty good – though we were a few storefronts off – Piola is coming to the boarded up building between Midtown Youth Academy and Dynasty Ethiopian Restaurant. From all we heard yesterday, the arrival of Piola to the 14th St, NW corridor is very good news. You can tell from the photo above that there is still a bit of work to be done before they open. When I called Piola’s Virginia store for confirmation they said they’d be shooting for a summer opening. I’ll be sure to update when a date is announced.